Grab breakfast in South Fork, and start the first leg of your trip at the old water tower, which serviced steam locomotives til 1956. Hwy 149 then winds along the banks of the mighty Rio Grande. 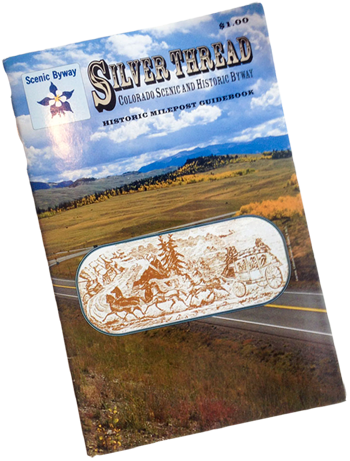 Catch a glimpse of an elk or deer as you travel by Coller State Wildlife area (where the Ute Indians set up their hunting camps). Marvel at the Palisade rock formations and take a quick peak inside Post Office Rock, where early settlers would leave notes for those in the mining camps. 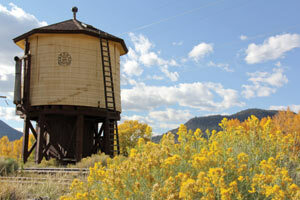 Pass through Wagon Wheel Gap and travel on to the historic mining town of Creede. Browse art galleries on their dramatic main street and tour the Underground Mining Museum (yes, visitors enter mine shafts bored into the cliff face, wander through tunnels mined from solid rock, and visit with former hard-rock miners!). Continue up the canyon a bit for a spectacular view of the Commodore mines. As you get back on Highway 149, Bristol Head Mountain looms ahead. You will loop around its southern side, and meet back up with the Rio Grande as it snakes its way through the outer rim of an ancient volcano. 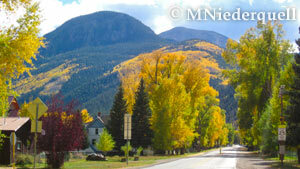 Travel by San Juan City, a former toll road stop, and begin climbing Spring Creek Pass. 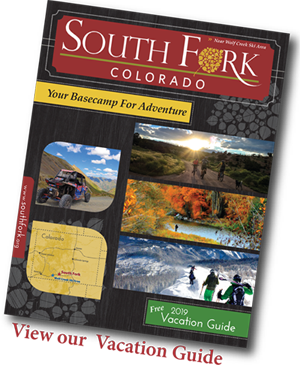 A bounty of natural wonders preside, including the sparkling and spectacular North Clear Creek Falls, the Slumgullion earth slide, and the shark-like fin of Uncompahgre Peak. Spring Creek Pass is steep, and must be traveled carefully. These mountains can be unforgiving so be prepared before embarking on any journey. (Legendary John C. Fremont lost 1/3 of his men in 1848 here, and a quarter of a century later Packer cannibalized his companions in two ill-fated winter expeditions). 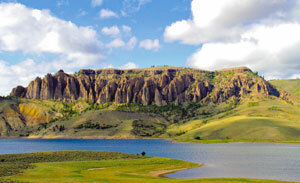 Take in the turquoise-colored Lake San Cristobal from a steep vantage point, and descend into Lake City. This picturesque town has over 200 buildings in the historic register. Stop for lunch and a walk around town. Head out through the steep canyon walls of the Lake Fork, passing by The Gate, an impressive rock formation. 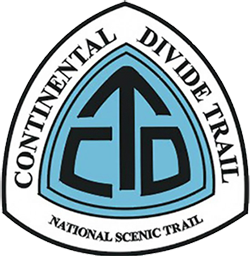 This final leg of the trip takes you towards Gunnison, through widening valleys where successful ranching communities sprang up and prospered. 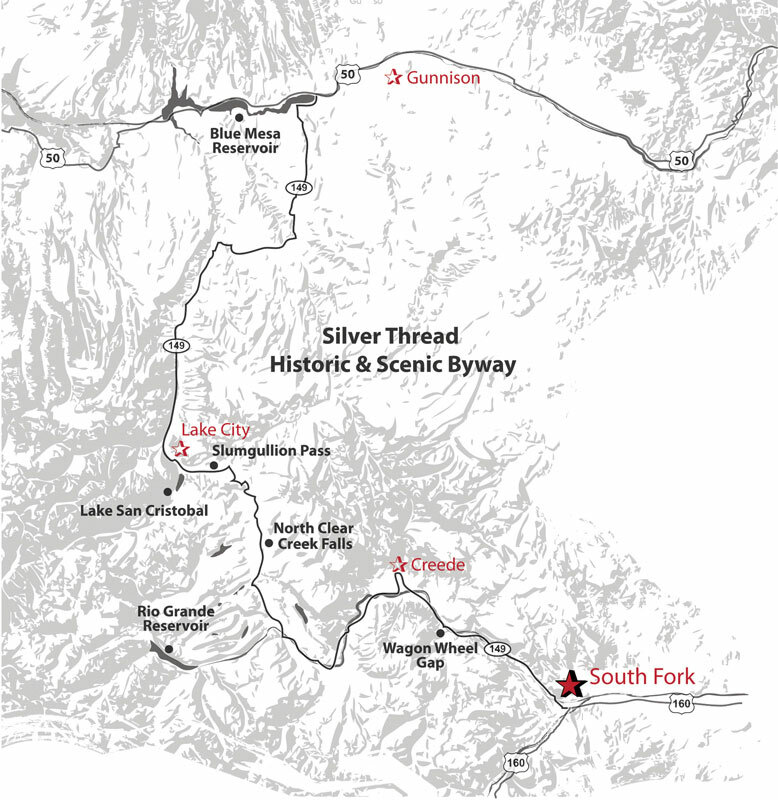 End your trip crossing the Blue Mesa Reservoir (a hot-spot for trophy lake trout) and entering Gunnison, a former Ute Indian summer camp - turned ranching community / college town. Your return trip back over Spring Creek Pass will be met with a spectacular view of the sun setting over the San Juan Mountains. 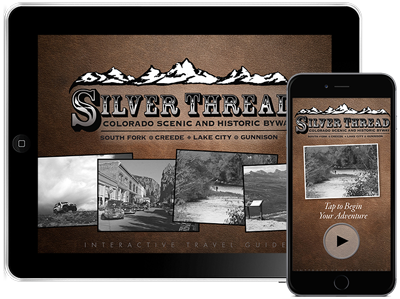 Stop in Creede for dinner and a showing at the highly-acclaimed Creede Repertory Theatre, then return to South Fork where hospitality is a big as the west!